My days goes past in an almost identical pattern where I spend the mornings juggling between breakfast and cleaning the house and somehow getting the family on one table for breakfast.There on, after my husband leaves for work, I am at the service of my baby. We giggle,we laugh, we make piggy faces ,we sing “if you are happy and you know it”,we sometimes clap and sometimes just laugh while, yes rolling on the bed and somehow in the middle of all this I also cook.There are definitely ups and downs but it’s mostly Sunshine and Rainbows. If you are wondering why I am being so candy and cakes its cause I just devoured the best meal of the month.And whats more?It can be made again and again cause I made it.My new Favourite Ginger and Pomogranate Chicken.This Pomegranate Chicken doesn’t need fancy ingredients just your everyday pantry staples. It goes splendidly with brown rice though I think it would be wonderful with some sticky rice.I am contemplating adding this to my Christmas menu as an appetiser cause my friends love saucy spicy chicken starters more than a cheese platter.Infact a cheese platter will just throw them astride and make them order some tandoori chicken from Anjappar(All Hail Swiggy! ).One thing I can say without doubt is that it’s the best Asian inspired Chicken dish I have ever cooked and I intend to make it every week. It’s such a beautiful blend of Sweet, Sour, Salty and Umami with generous hints of Chilli. I have used two types of chillis in this-dried chilli flakes and fresh red chilli which has very little heat and it more for the flavour than the heat. My earnest suggestion is for you make fresh pomegranate juice and remember not to not strain it.The solids from the pomegranate seeds will give more body to the gravy.I marinated the chicken in salt and pomegranate juice for about 1/2 an hour. Marinate the chicken in the pomegranate juice and salt for 15 minutes to one hour. Add oil to a pan on medium high flame. Temper it with garlic & ginger. Add the Chicken pieces without the marinade.Let it brown on high flame for 5 minutes. Add the marinade once the chicken has browned to your satisfaction. Season with soy sauce,honey and chilli flakes.Add more salt if required. Allow it to simmer for 10-15 minutes till the juices thicken and darken in colour. Remove from the heat.Your Chicken is ready. 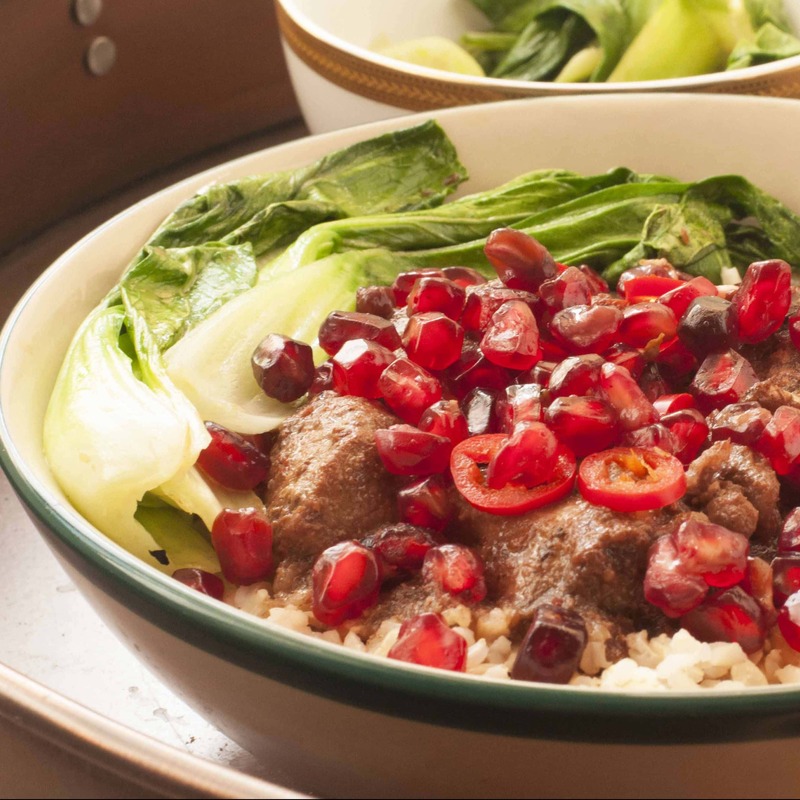 Garnish with pomegranate arils and Sliced fresh chilli. If you cook the chicken with marinade it will not brown enough and the gravy will reduce. Chicken should be boneless and cut to one inch size. I used Dark Soy Sauce.If using light soy then increase the quantity to 2 tsp. If on whole 30/Paleo substitute Soy sauce with Coconut Aminos.